Citation Information: J Clin Invest. 2018;128(8):3228-3230. https://doi.org/10.1172/JCI121744. CD1a+ VEDCs are purified from the vaginal epithelium. VEDCs preferentially replicate HIV-1 using CCR5. VEDCs express SAMHD1, which acts as a cellular restriction to HIV-1. 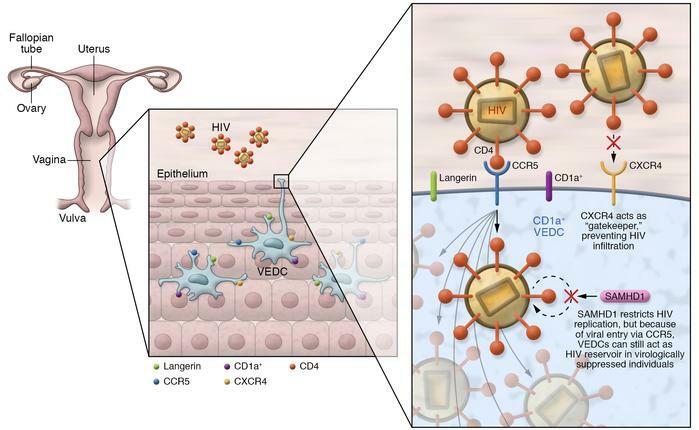 However, although VEDCs can be gatekeepers by not being infected efficiently by CXCR4-using HIV-1 strains, they can contain virus even in virologically suppressed women and are therefore potential reservoirs for the virus.